LaFayette Middle School eighth-graders Sam Peters, left, and Breanna Best say they are happy to be able to earn high school credits to help get them ahead. 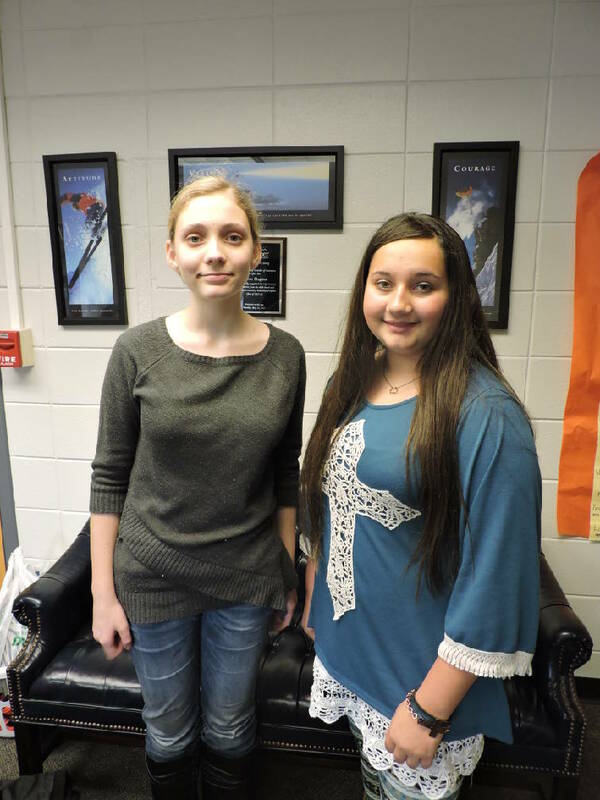 LaFayette Middle School eighth-graders Sarah Willeford, left, and Cheyenne Hamilton say they are happy to be able to earn high school credits to help get them ahead. LaFayette Middle School eighth-graders are earning high school credits now to take with them for advancement. Eighth-grader Sarah Willeford is one of the 152 students taking the higher level classes for a combined 104 high school credits. "This gives us the amazing opportunity to get high school credit," Sarah said. "It really helps personalize the experience. The high school credit gives us a way to get to college and succeed in life goals. I'm taking advanced agriculture, advanced physical science, advanced math and advanced social studies." She said she is most excited about her high school credit agriculture class. "We have added an Introduction to Agriculture at each of our middle schools which does give the students a high school credit as well as an introduction to a potential career pathway," said Walker County Schools Superintendent Damon Raines. "It also introduces them to their feeder school ag program teachers and the possibilities associated with this choice." Eighth-grader Cheyenne Hamilton is taking high school credit classes in agriculture and Spanish. She said she appreciates the way the teachers set up the advanced classes. She especially likes going over a new poem in Mrs. Scoggins class each day. "The whole high school credits program is incredibly inventive," said Sarah. "I've learned life lessons. Now I can properly set up a notebook. I know how to properly take notes. We learn even small things to help us be successful in the future. Taking high school credit gives us the opportunity to work on our own sometimes. It gives us the opportunity to self-learn and grow emotionally and educationally." 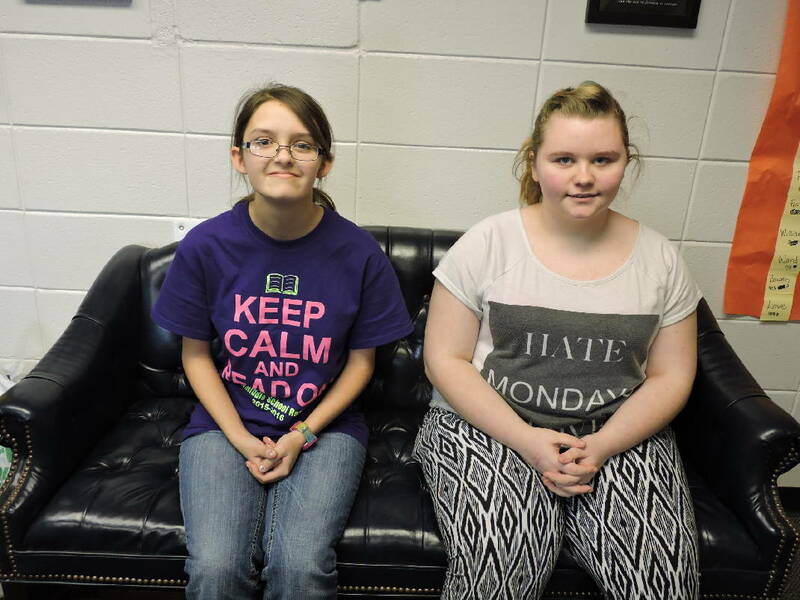 Both Cheyenne and Sarah will graduate from LMS with two high school credits. "That will also open Cheyenne and Sarah up to dual enrollment," said LMS Principal Karen Hughes. "The college class is free at the high school as part of dual enrollment. After one semester in high school, they could be a sophomore." Brodie Leiser is taking four credits: math, science, ag and Spanish. "Science is my favorite subject in any school ever," he said. "We are learning about physical and chemical properties and matter." Breanna Best, who is taking Spanish for high school credit, said it is a good opportunity to get a head start on what to take in high school and beyond. "It's amazing how the teachers get them reading for high school connections and college," said Hughes. "It will give them more opportunities in a career pathway." She added that the teachers provide a variety of ways students can learn through different learning styles. Teachers also give them options, so the students have a choice in what they create or produce to reach standards mastery.